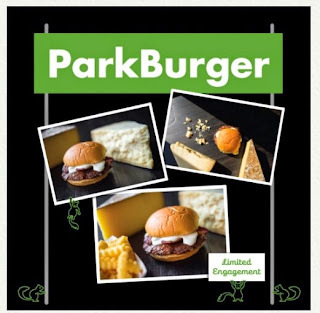 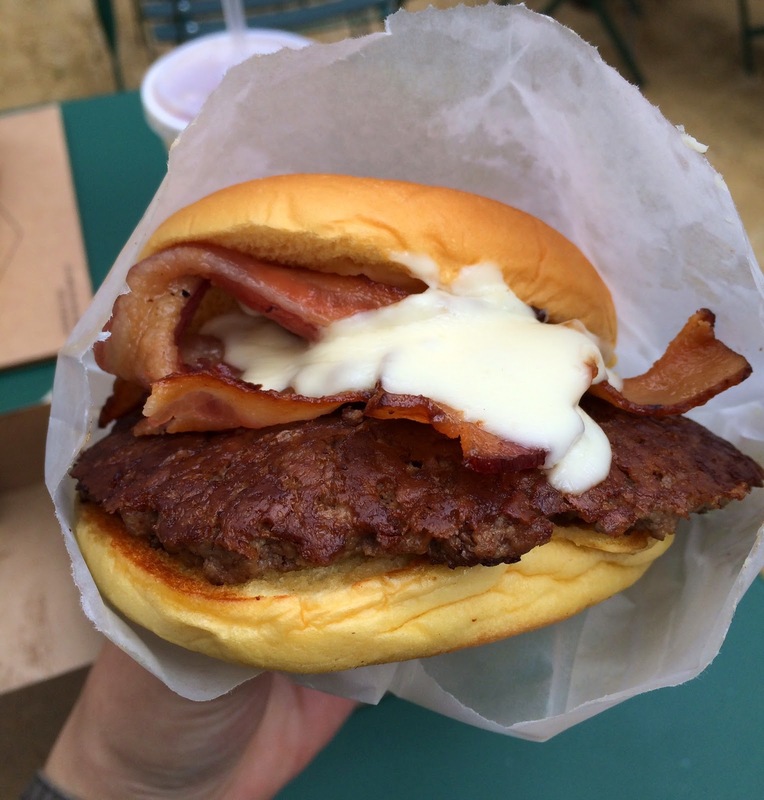 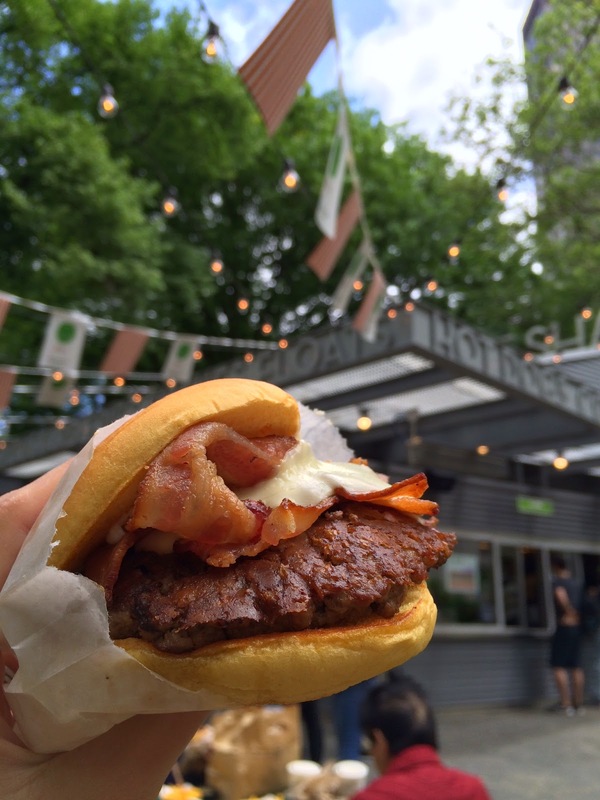 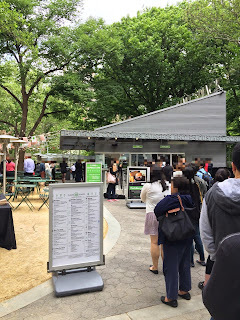 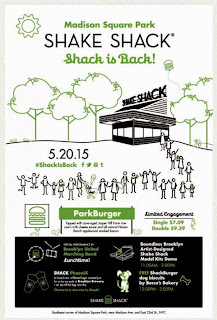 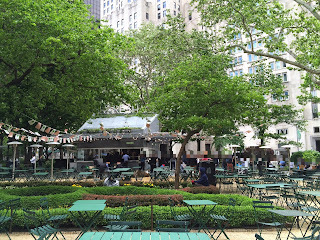 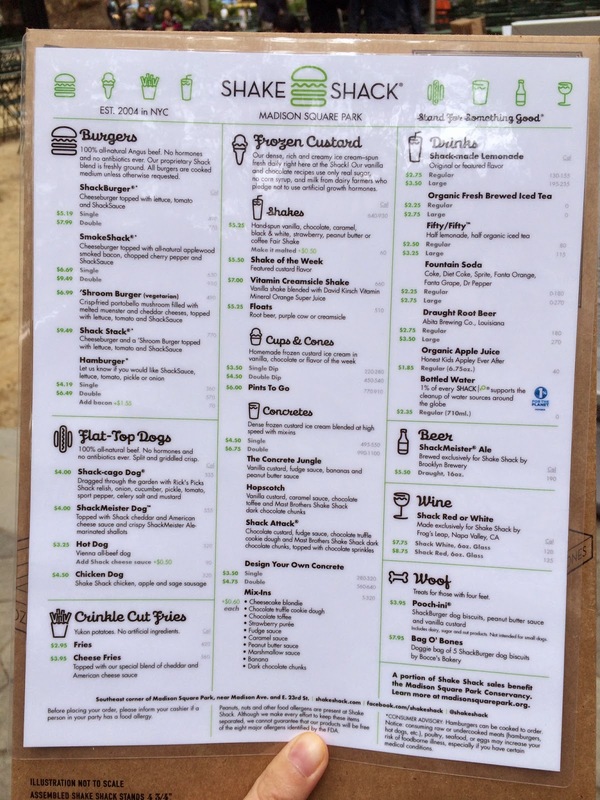 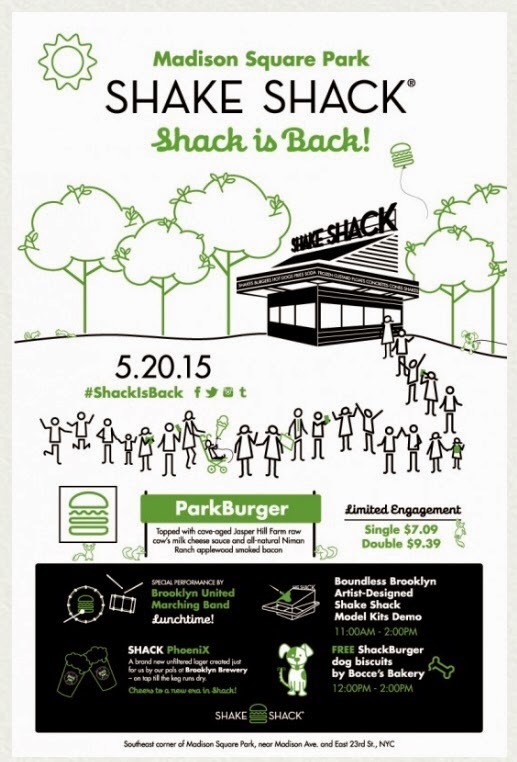 Last night, I learned Shake Shack at Madison Square Park would be reopen today, May 20, 2015, and I decided to go there to try a special burger called "ParkBurger" which is only available at this location. 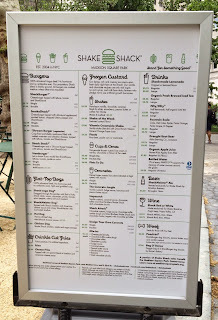 This is the original Shake Shack restaurant opened on June 12, 2004, and it has been temporarily closed since October 14, 2014 for renovation. 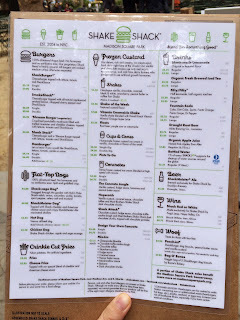 As the restaurant re-open at 11 AM, I planned to get there before 10:30 AM. When I checked "The Shack Cam" which lets you see the line at the shop at 8:30 AM, I saw a person was already there and waiting. 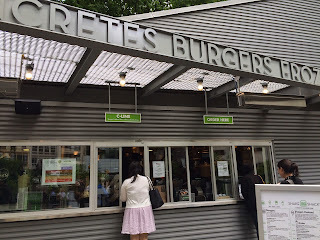 At 9:50 AM, there're about 15 people waiting and my husband said I should go soon, so that I quickly left home. I got there around 10:20 AM and the line extended to about 50 people plus a TV camera and photographers. 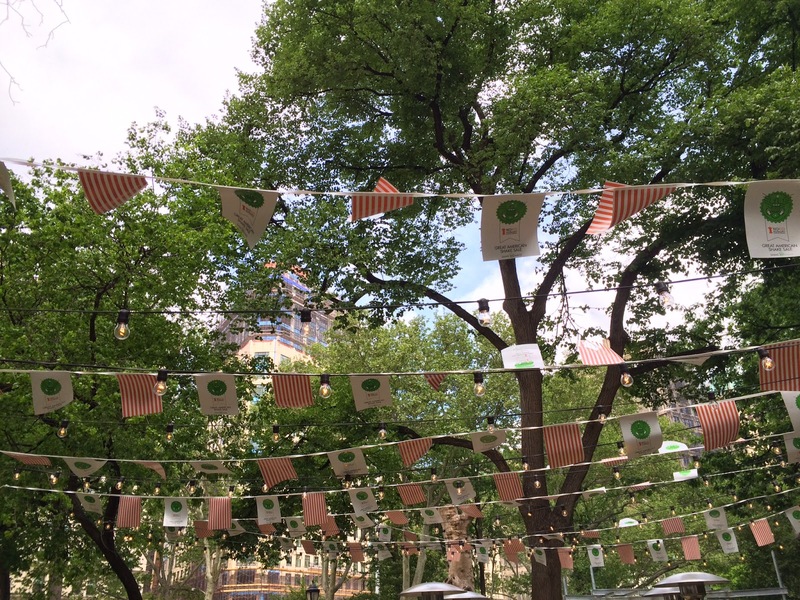 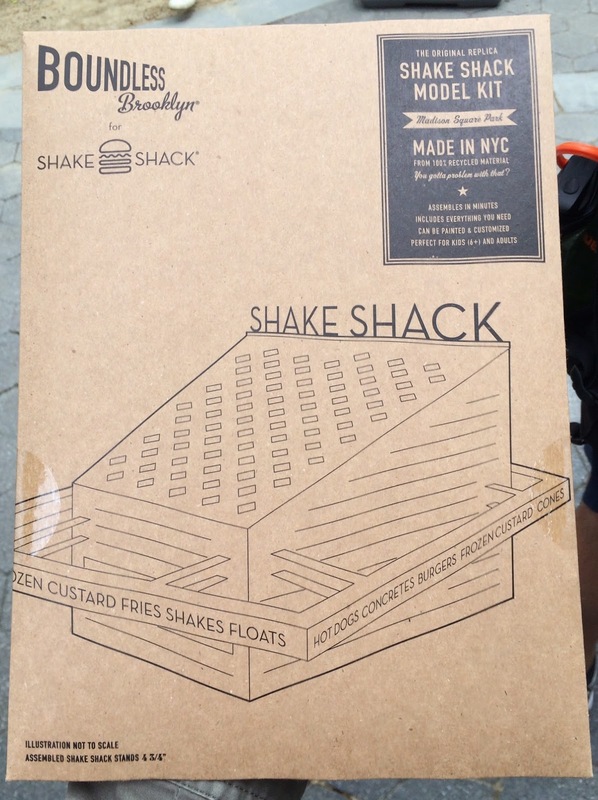 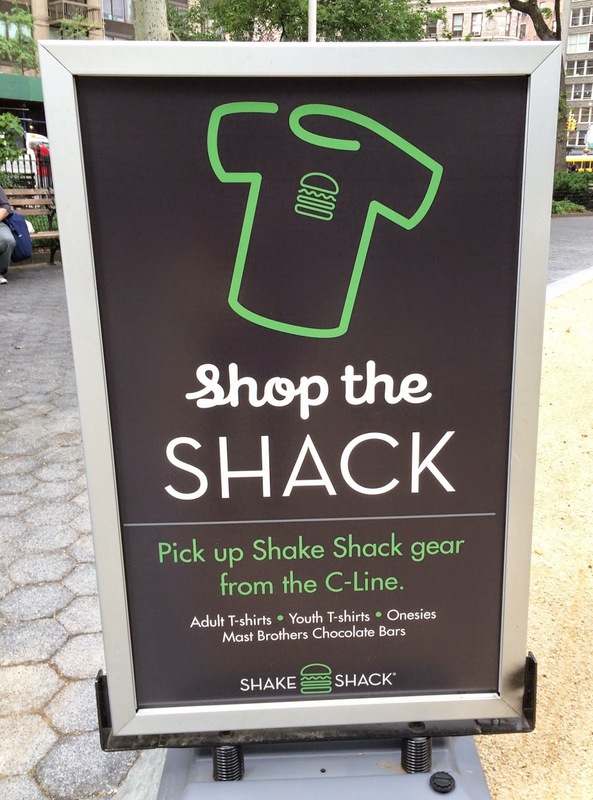 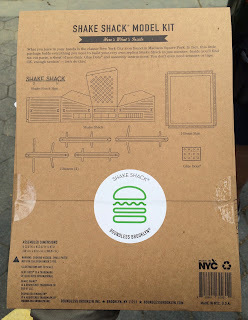 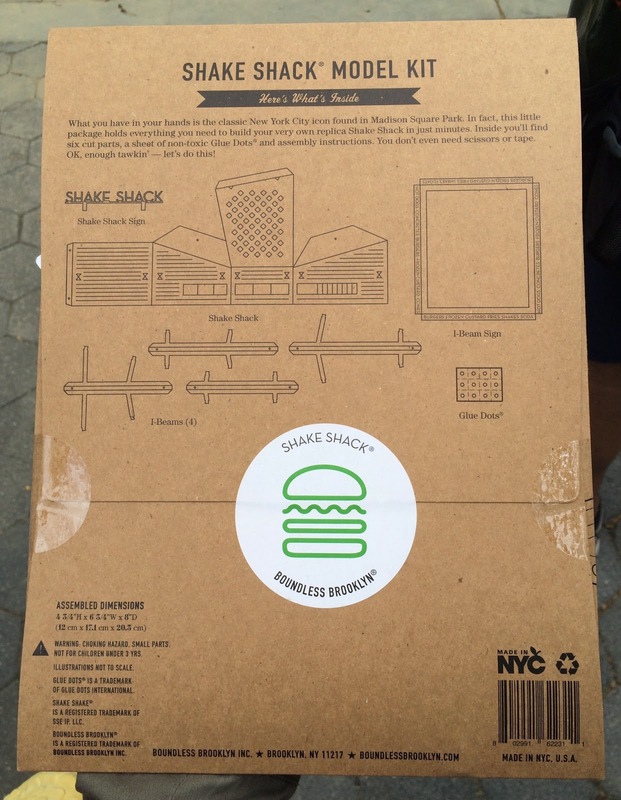 At 10:30 AM, they gave away a kit to create a miniature of Shake Shack at Madison Square Park. 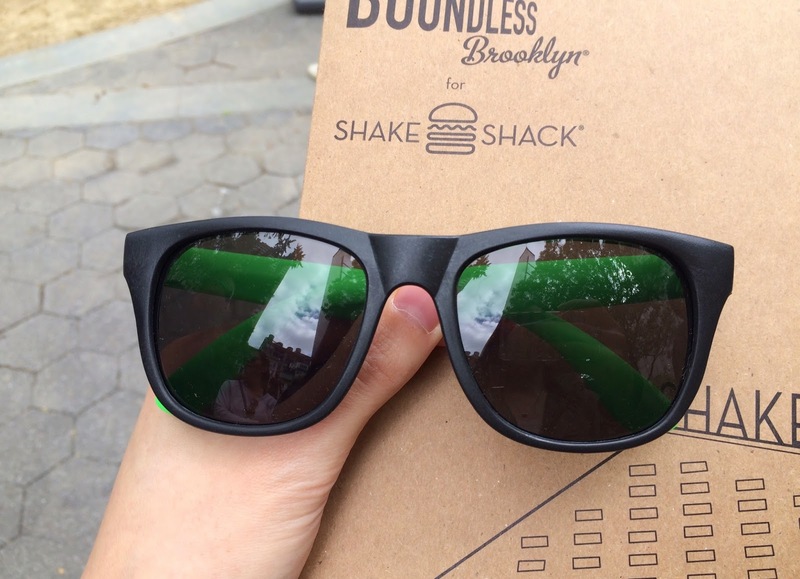 It's created in collaboration with Boundless Brooklyn and made of 100% recycled chipboard. They're also selling this item for 20 dollars. 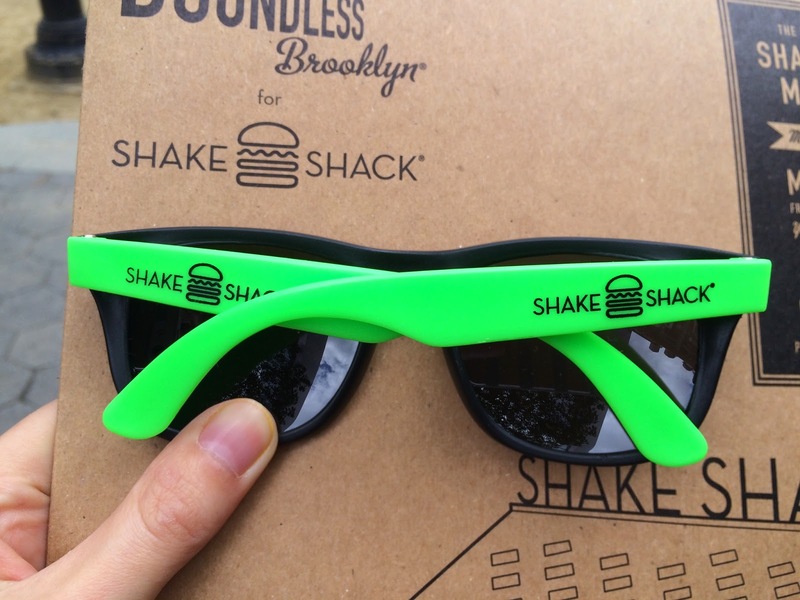 Soon another employee came and provided a pair of Shake Shack sunglasses. At 10:45 AM, they started preparing a long green ribbon around the customers. 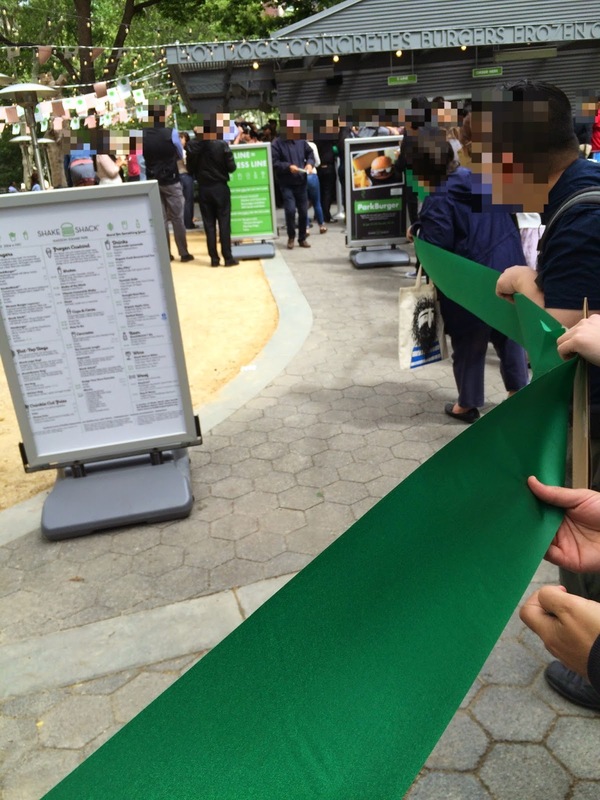 However, I'm not sure when they cut the tape. 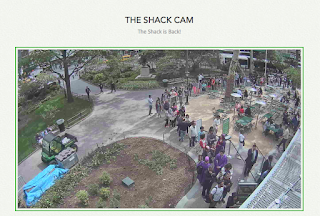 At 10:50 AM, CEO (or some executive) made a speech and employees started making some noise. 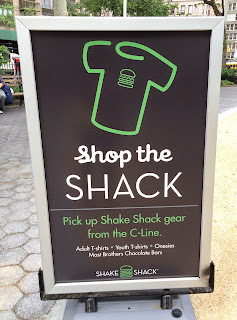 This is what I heard; "Sha, Sha, Sha, Sha, Sha, Shack! Everybody!" 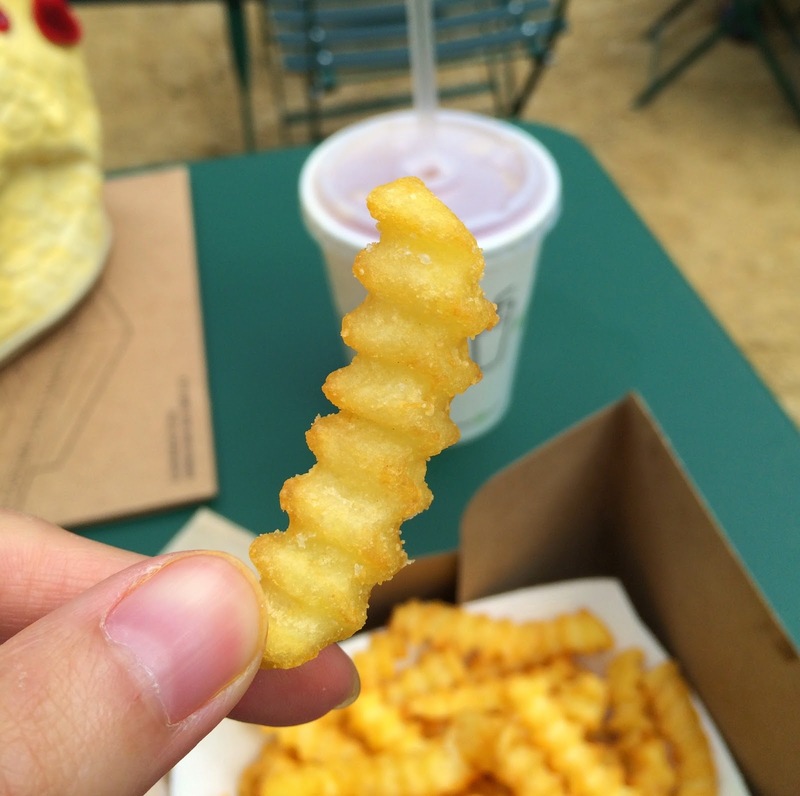 like "Shots" by LMFAO. At 10:55 AM, an employee started providing a menu that had the special burger labeled as "Limited Engagement." 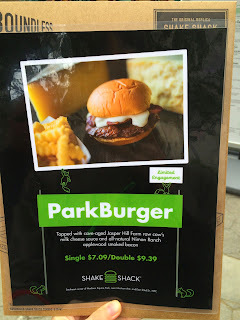 I was here for this burger but afraid this burger might contain mayonnaise base sauce like ShackBurger, so I asked her about the sauce and she said the ingredients used in the burger is only those ones listed underneath the photo. "Topped with cave-aged Jasper Hill Farm raw cow's milk cheese sauce and all-natural Niman Ranch applewood smoked bacon." 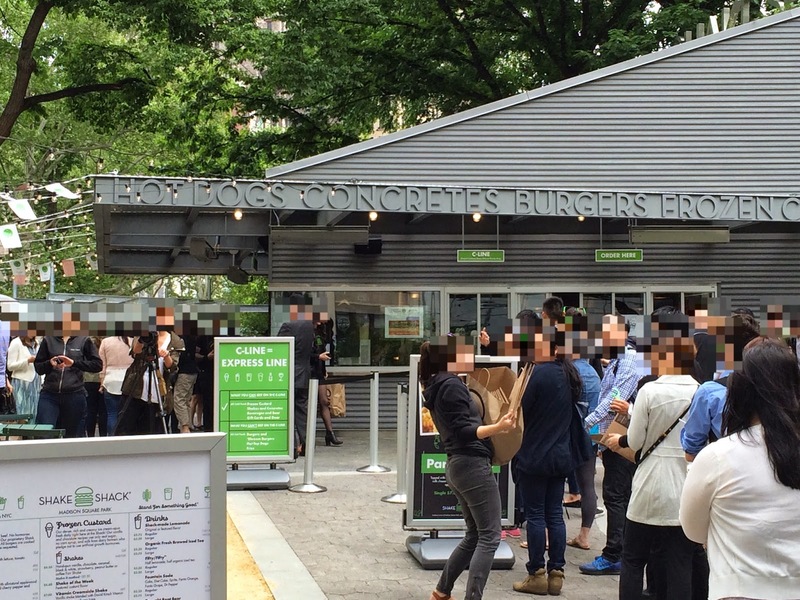 At 11 AM, they opened the counters and started taking orders. 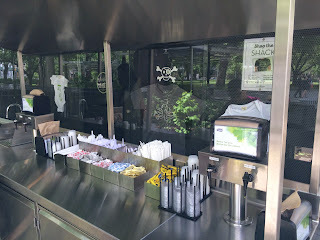 By the way, there's an express line called "C-LINE" where you can get all cold food; frozen custard, shakes, concretes, beverages, beer, gift cards and gear. While waiting, I received a sample. 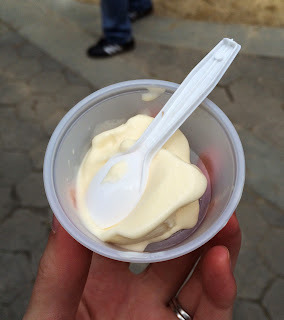 I think it's frozen custard and it's very creamy and smooth. 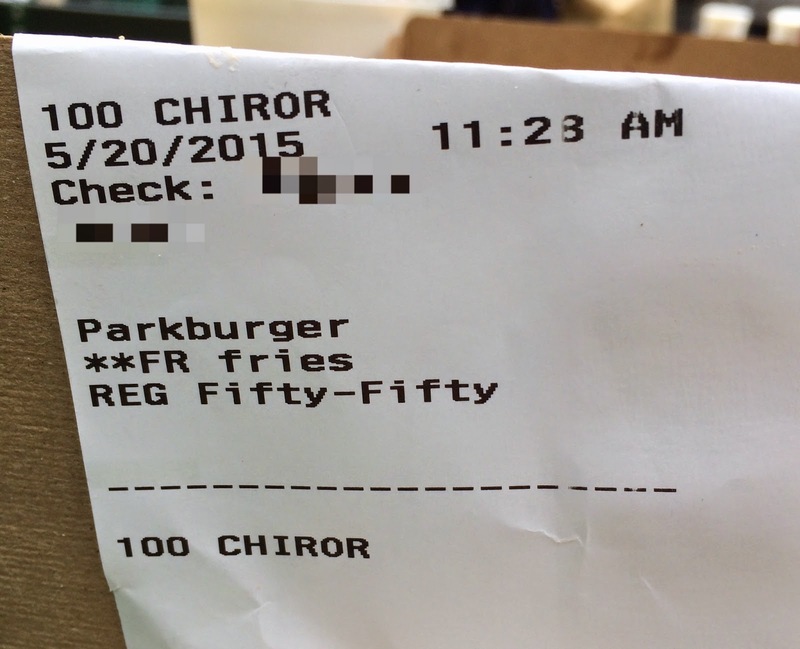 I ordered a single ParkBurger, Fries and Fifty/Fifty. 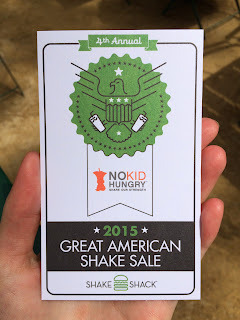 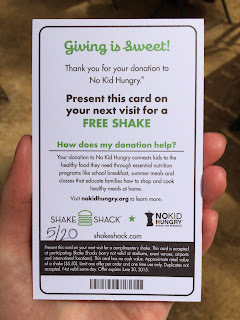 When I was about to pay, the cashier asked me if I wanted to donate 2 bucks for No Kid Hungry and I'll get a free shake next time, so I said yes. 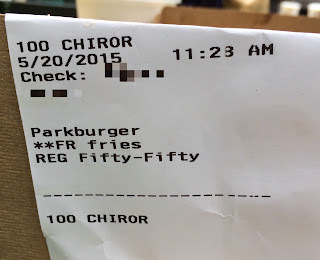 He tried to find my name on my credit card but my last name is so long that my first name was cut off, so he asked my name again and I spelled it out. 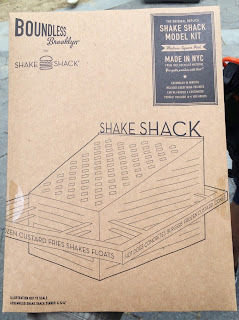 But in my mind, I kind of knew it'd be messed up. 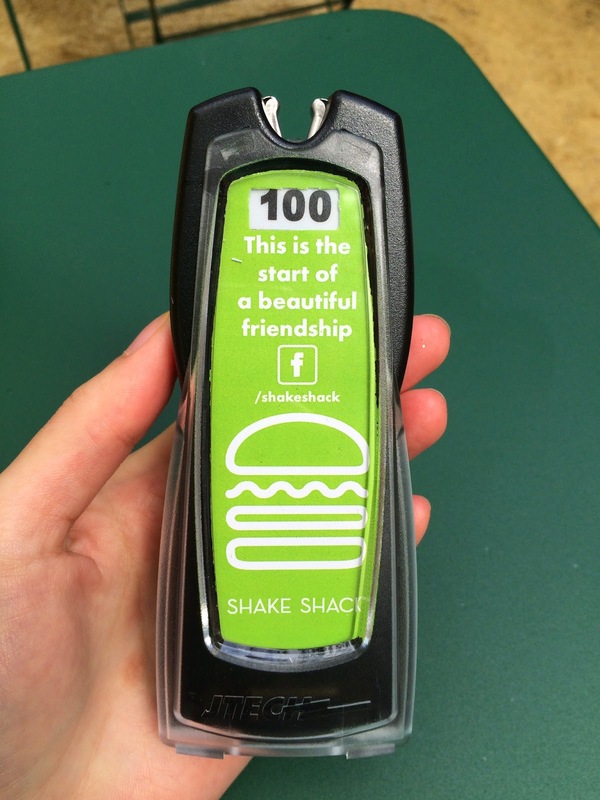 The beeper went off after about 10 minutes and I went to get my food and drink. 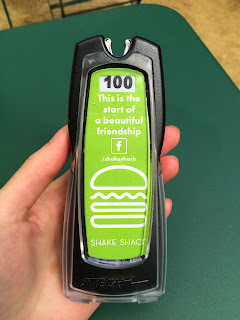 There's no straw and I asked an employee, then she said it's set around the corner. 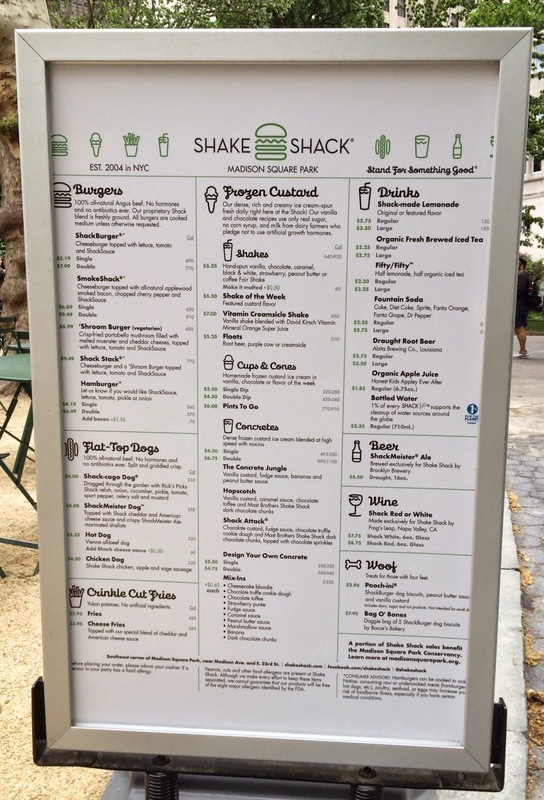 The counter with utensils and condiments was hard to see and there's no sign for that, and I thought it's a bit inconvenient. 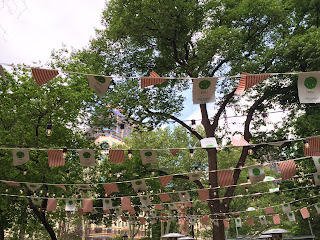 I decided to eat under these flags and lights. ParkBurger was looking so tasty and fries smelled very good. 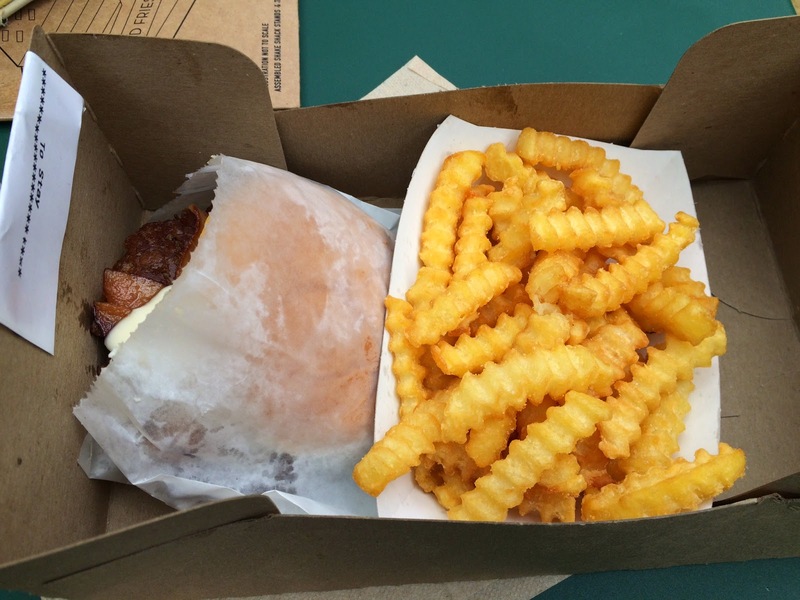 The yellowish buns were subtly sweet, soft, and moist. 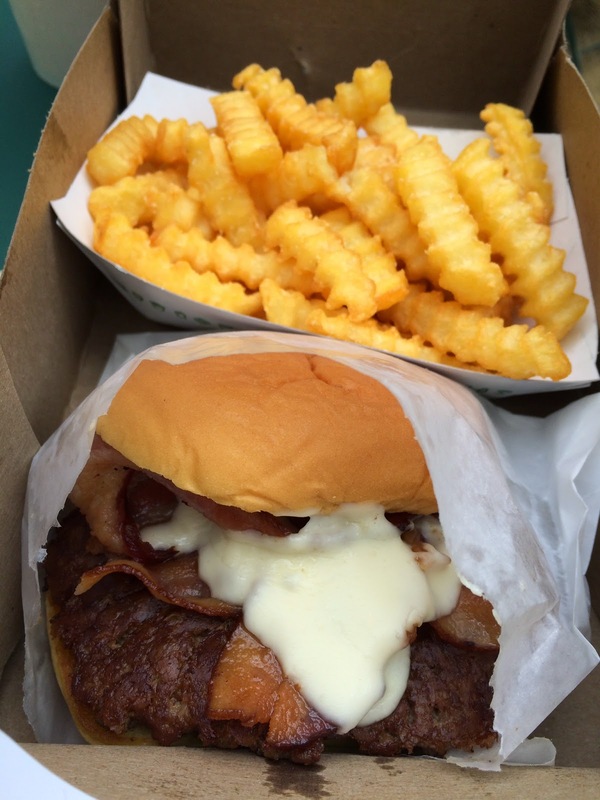 The cheese sauce was creamy and velvety, and the flavor was mild without intense odor and had a hint of saltiness. 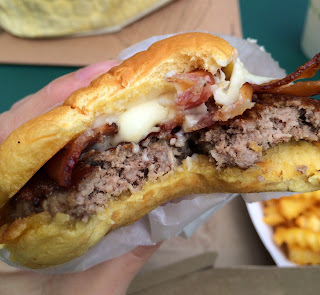 The patty looked well done and not medium like ShackBurger I had at JFK, but fortunately, it's still juicy and not dried. 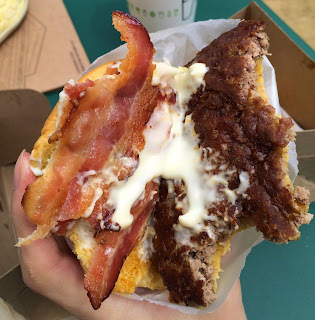 Bacon strips were half crispy and half gooey, but thanks to the flexibility, they stayed in the burger and didn't crumble so that it's easy to eat all the ingredients at once. Regarding applewood smoke, I didn't sense any smoky flavor in the bacon nor odor of the fatty flesh as the cheese sauce was rich and that's the first thing I taste. 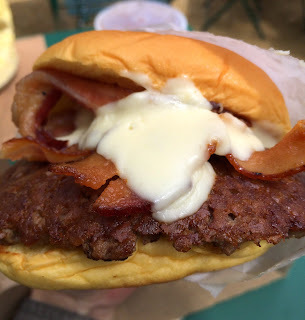 However, the amount of the cheese sauce put on the burger wasn't too much and I sometimes find bacon stinky and I felt like the sauce was wrapping up the scent and greasiness. I enjoyed this burger a lot of the simplicity; beef patty, bacon and cheese sauce. 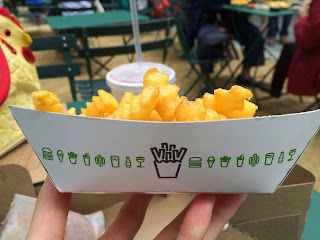 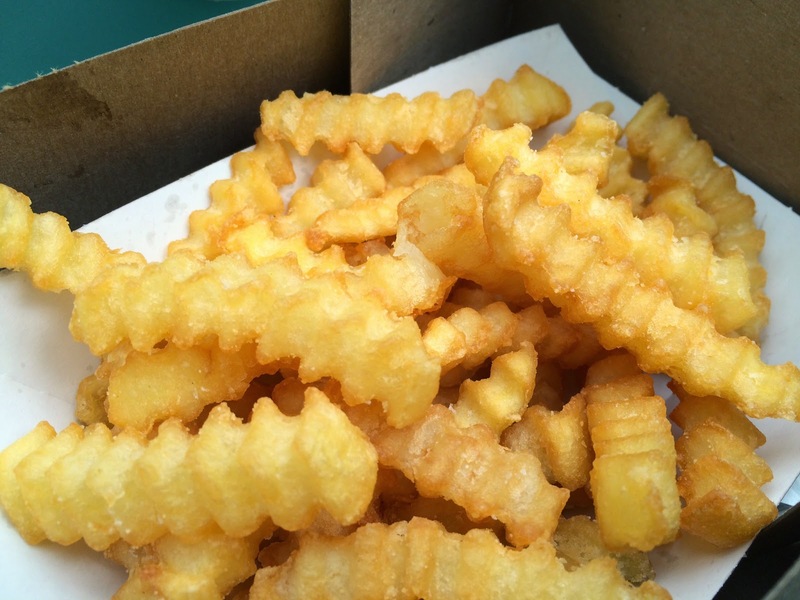 Each fries was very crispy outside and moist inside. It's half lemonade and half organic iced tea. 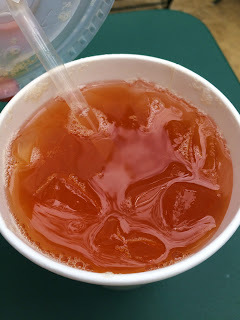 It had strong lemon flavor and it's much more sour than I thought and had some bitterness of tea. 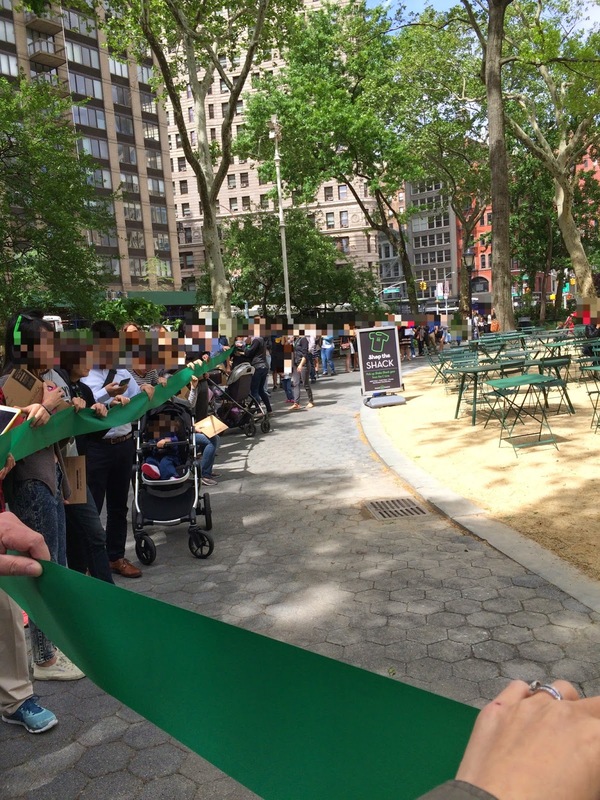 When I left, the queue extended to the entrance of the park facing Flatiron Building. 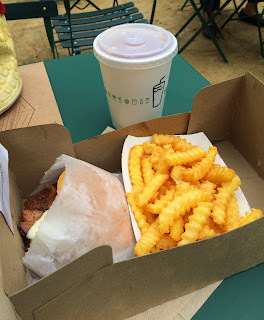 Another review of Shake Shack.